Click here to apply for new classes starting from 19th March and 2nd April. 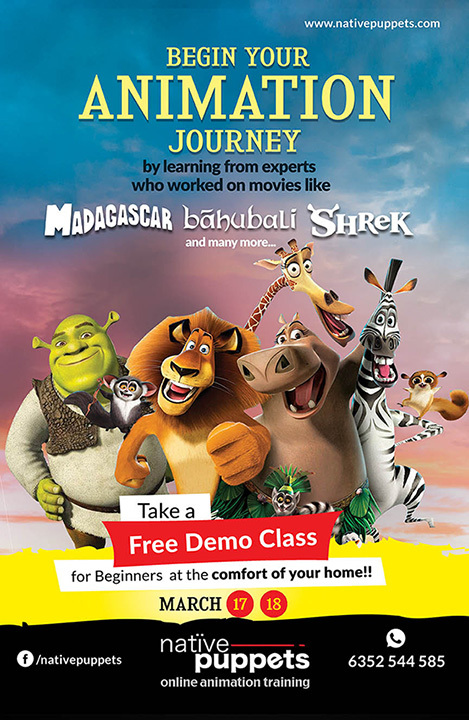 Click here to register for Free demo class on 17th & 18th March. Do you like Cartoon/VFX/Game/Animation related entertainment? If you have basic computer skills, then you can join the session. the overall process of creating a Computer Animated Film. You ​will get ​an introduction to the magical world of Animation​ and provide you a greater understanding of the different disciplines of computer animation. It will also teach you the tools and interfaces of industry standard 3D software with which you will bring your imagination to life! Ever wanted to take first step towards being an animator? Ever wondered how those cool characters you see on movies come to life? Attend this class and find out what it takes to be an animator. You can be a student, a beginner or even a professional from any field. After attending this session you will have an inside look of the world-famous 3D-Animation software called Maya, which is used to create high-end visual effects and blockbuster animated movies that you enjoy watching. You will also witness how using the principles of animation, simple primitive objects jump to life. All in all, you will see 3d-animation-magic be created right in front of your eyes, that will hopefully inspire you take up Animation as a career! ​Students who are complete beginner, we’ll teach you all the modelling fundamentals you’ll need. If you’re an artist, we’ll teach you to bring your assets to life. have an understanding of the building blocks on the basic principles of 3D Modeling. You will also have a peek into the world-famous 3d-animation software Maya’s interface. You’ll also be introduced to the world of creating characters and environments in 3D using simple primitive tools. Enjoy telling engaging stories? Story-boarding, a process of visually communicating the intent of the story in the simplest and quickest of ways by creating well-composed drawings and doodles. Attend this class and find out what it takes to be a good story-board artist. You can be a student, a beginner or even a professional from any field. This session will provide insights to attendees with the Art and aesthetics of Storyboarding for films, Games and advertisements. At the end, attendees will know how fun it is to storyboard an idea of narrative and give it a visual form. This session is also useful for those who are aspiring to become good storytellers, 3d-modelers, sculpting artists, editors and animators. If you ever thought that being part of Animation & VFX Industry, you need to be creative and have amazing drawing skills, think again! Production Management is a very critical department in Animation & VFX Movies film-making process, which engages all the creative and technical departments together. This department extensively deals with the management aspect of a project. learn how your passion and interest towards animation industry is all that is required to be the part of Animated Movies & VFX world. This session will help you understand the project management skills that movie producers are looking in a candidate while picking up the crew for movies. No problem. It’s as simple as it can be. Just follow the below process. Webinars are like any other seminars / sessions that you attend at an event, only difference is, Webinars happens right at the comfort of your home and the best part is, you can interact with the speaker too. • Register for the Webinar. • You will receive an Invitation 1 to 3 days prior to the Webinar. Click on Accept / Join. • At the time of the Webinar, open the Confirmation Email and Click on ‘JOIN WEBINAR’. Native Puppets frequently conducts Webinars for the benefit of the community, so professionals, students and aspirants can meet and interact with Industry Experts, right from the comfort of their homes. In these sessions, the Speakers share tips, tricks, do’s-don’ts, share their experiences, discuss on workflow methodologies, case-studies and how to make a mark in the industry. This will be an Interactive Session, where participants can ‘Ask Questions’ to the Speaker directly. These Webinars are Free of Cost to Attend. See you in there! Native Puppets is an online program focused on providing high quality training in field of Animation & Visual Effects. Courses range from artistic to technical direction departments of a CG Pipeline. Everything about the program, right from the curriculum, the assignments and student site has been designed and developed by leading professionals from the animation industry across the globe, who have worked in studios like DreamWorks Animation, Weta, Double Negative, Framestore, Technicolor, Xentrix Studios, 88 Pictures. Know more about our course HERE. For regular updates, Visit Us on Facebook! In this webinar, Dave will talk in detail about how he approaches acting in animation, his thought-process right from planning his shot to final polish pass. Dave has over 30 years of industry experience having worked on many blockbuster hollywood features both at Disney & DreamWorks Animation. David Burgess is currently in working on The Lego Movie sequel, due to hit theatres in Spring 2019. Prior to this, Burgess worked at DreamWorks Animation where he served as head of character animation for animated features like Trolls, Turbo and Monsters vs. Aliens. He is also known for his work as supervising animator on Megamind and Over the Hedge. At Disney, he worked on many of their most successful hand-drawn productions. His assignments included: supervising animator on Tarzan (Professor Porter) and The Lion King (The Hyenas), as well as working as an animator on Beauty and the Beast (Gaston/Bimbettes) and Aladdin (Genie), among many others. In the next segment of Meet the Expert Webinar series, Native Puppets presents – ‘Making of Bot Rods – ‘a high adrenaline racing game set in a futuristic world’ by the creator Nirmal David – Founder / Creative Director, Hobo Studios. Nirmal, a game-design expert who will walk you through the process of game development right from the ideation stage, level-design, game mechanics, production and the eventual promotion and distribution of a game. Short note about the game – ‘the Bot Rods world is inhabited by adorable characters from many species and their equally lovable Bots (robot vehicles). Check more about Bot Rods at – http://botrodsthegame.com/ and be ready with your questions during the webinar on 7th October, Sat, 11.00 AM IST. As an animator, one of the most satisfying moments is when you get the ownership to develop a character by identifying certain traits and mannerisms. Join us for a Webinar with the talented Nicolas Chauvelot who as Lead Animator / Supervising Animator on various shows has shouldered this responsibility. Hear from Nico how he approaches developing nuances for a character that is idiosyncratic to the personality. Nico graduated from Gobelins (Paris), has over 10 years of industry experience in the Animation industry. He has very high-level of understanding of animation timing, acting and storytelling techniques. His ability to bring about strong appeal in characters and uniqueness in acting choices saw him quickly rise up the ranks in becoming Lead and Supervising Animators on various high-quality projects while at DreamWorks Animation. In 2011 Nico was nominated for Annie Awards for the Shrek franchise Scared Shrekless in the Best Character Animation Category. He currently works at ON Animation Studio, Montreal, Canada as Lead Animator. The number of things to keep track of on a Animation or VFX Production can be mind numbing! Autodesk Shotgun makes it much easier to navigate this elusive maze of handling Production for CGI Projects. Developing stylised characters for animation is not as easy as you might think, and infusing those characters with long-lasting appeal is even harder. Join us with Ravi Kamble, Lead /Supervising Animator on various shows, on how he developed his expertise in stylizing characters through his own unique way. Hear from him the approach he took while developing Dave – the Octopus (one of the most challenging characters of CGI Animation) while working on Penguins of Madagascar on 16th Sept, 5pm IST. “Why Kattapa killed Bahubali” was finally revealed in prequel but how & what were the initial stages in storytelling of Bahubali that led to the formation of mega blockbuster? Native Puppets in the next webinar will take you through the journey of Bahubali with Santosh Dora Babu, Previz and storyboarding Supervisor, on “Storytelling of Bahubali”.